At the tail-end of last year, Joshua Owens-Baigler – having previously worked at The River Café – announced plans to open Angelina in Dalston. 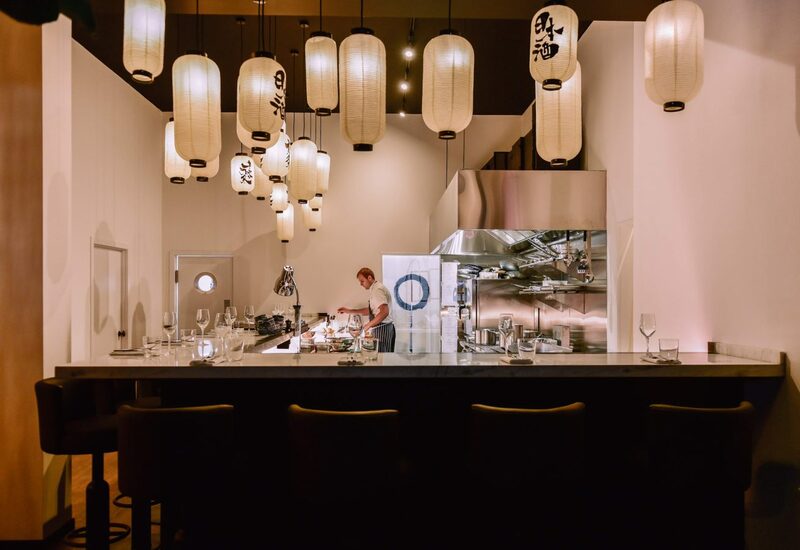 With Roman chef Daniele Celforo heading up the kitchen, the restaurant serves a regularly changing tasting menu which fuses Italian and Japanese influences. Angelina is not a fusion restaurant, however. The ‘F’ word suggests the gastronomic equivalent of a Jack of all trades, combining outlandish flavours without any feasible reason; often with little respect (if any) for the national cuisines employed, for humane rationality, for the poor customer who’ll have to endure a parade of culinary car crashes. 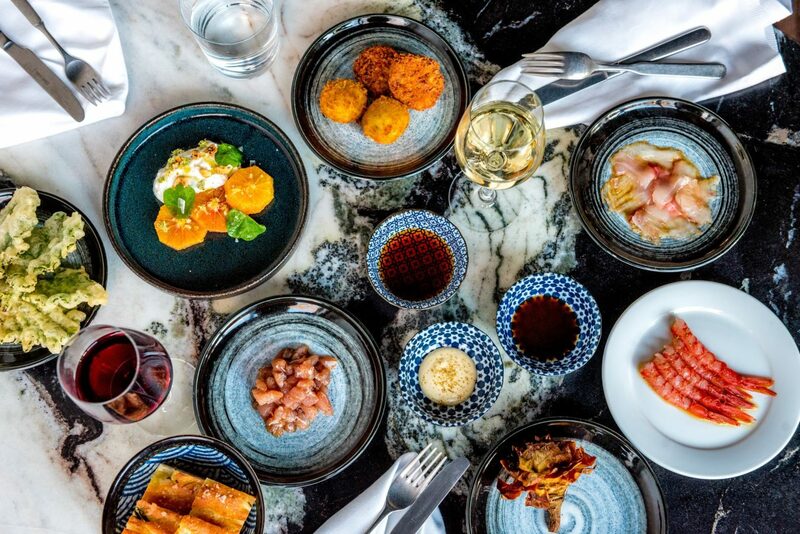 Here, the kitchen’s creations share both Italian and Japanese respect for ingredients, regional cooking and seasonality, with a five-course tasting menu (£38) that’s decidedly unfussy. Inside, the large space is fronted with floor-to-ceiling windows, with the chic interiors designed by Joshua’s mother: think large plants, sympathetic lighting from lanterns, and an Italian marble bar that separates the restaurant from the open kitchen (arguably home to the best seats in the house). Elsewhere, a speakeasy bar – Golden Gai – operates from a small room towards the back of the building, with seats for just six, enforcing a strict policy against the use of mobile phones. Cocktails champion Italian and Japanese spirits, including the likes of ‘Tokyo Banana’, comprising Suntory Toki whisky, Fernet Branca and a whisper of banana syrup. Service, on the other hand, strikes an ideal balance: accommodating but never overwhelming. During a recent dinner, Owens-Baigler was on hand to discuss wine pairings and some of the more unusual techniques and ingredients showcased at Angelina. A dish of shredded duck leg with soft bullets of potato gnocchi finished in a hot frying pan and crowned with lotus root crisps was, undoubtedly, dinner’s key highlight. Here, each element was near perfect, rampant with an intense umami flavour profile, bolstered even further by the addition of moromi – a by-product of sake production. The Tuscan Chianti Rufina wine pairing also deserves an honourable mention, rife with cherry, plum and some thyme. Hibachi pork followed, cooked using a hibachi grill (literally meaning “fire pot” in English), teamed with monkfish cheeks. While the monkfish was fractionally overcooked, the cooking of the pork was spot-on, though the accompanying Vignarola was the jewel in the dish’s proverbial crown – a Roman ‘stew’ comprising a holy trinity of vegetables: artichokes, peas and broad beans. To finish, a tart of Nashi pear (still astonishingly difficult to source in the UK) featured short pastry, accompanied by a generous helping of hazelnut which replaces almonds in a riff on frangipane. A selection of rare teas is also available, including Puglian cherry blossom tea, heady with earthy mushroom notes. Like everything else eaten here, dessert champions a happy marriage of flavours and techniques rarely combined with such success: an ethos that renders Angelina an exciting new addition to east London’s already booming restaurant scene. Angelina can be found at 56 Dalston Lane, London, E8 3AH.